« Fall Watercolour Classes at Arts on Adrian – Week Four! Fall Wednesday Watercolour Class at DVSA – Final Week! Eight weeks ago, I met this group and, bit by bit, identified what I thought they needed most in terms of process and techniques. The handling of soft edges has been near the top of the list and I’ve demonstrated several times with that in mind. Every Wednesday evening, I tape up the demonstrations that I’ve done to that point. This gives everyone a chance to review previous lessons. Last Wednesday evening was my final class at the Dundas Valley School of Art for the fall term. Why not finish off with another shot at those soft edges? First of all, I needed a still-life that would suggest softness and the teddy bears were ready to go. They love getting out of the box once in a while. 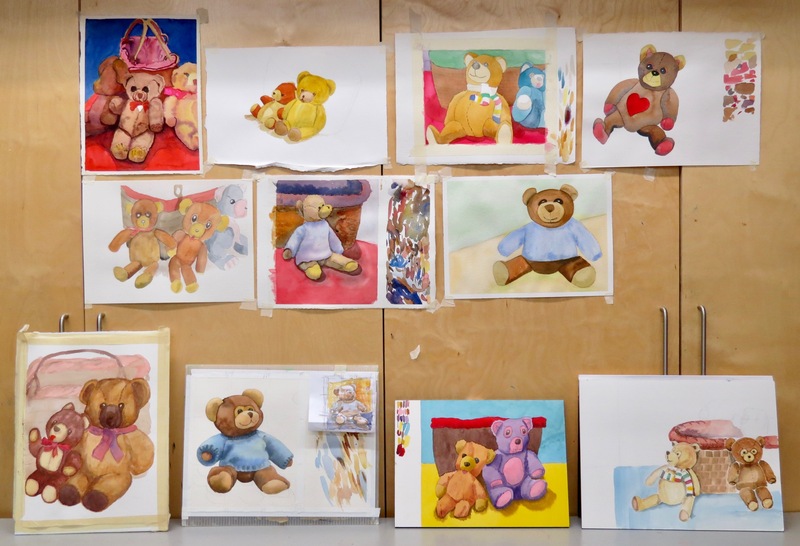 I painted the bear one shape at a time and tried to create a soft edge, wet touching wet, within each shape. It’s surprisingly difficult to do and takes a lot of thought and practice. I’ve enjoyed the last eight weeks with this hard-working bunch of artists. I’ve seen improvement and growing confidence in their work. Some have signed up for another round of classes with me that start in January and I look forward to working with them again. Care to join us? Check the DVSA winter calendar for details. This entry was posted on 01/12/2018 at 12:38 pm and is filed under Barry's Demonstrations, Dundas Valley School of Art, Studio Classes. You can follow any responses to this entry through the RSS 2.0 feed. You can leave a response, or trackback from your own site.